The winter of the month at the turn of the year is hard to consider as a good time for navigation in the Mediterranean. Stormy weather, often occurring during this period, causes ship crews to be exposed to extreme weather conditions. It was no different in the case of seafarers working on the Greek vessel Dimistros P., which at that time belonged to the Saporta & Peponis company. The story of Dimitrios P.
This unit was launched in 1921 in one of the German shipyards located in Lübeck. In 1955, the ship underwent renovation, during which a more modern diesel engine was installed in the engine room in place of the existing steam boiler. At the end of the sixties, after several dozen years of service and a few changes of owners, it was difficult to recognize him as a modern unit or even fully meeting the requirements of the then sailing. Still, this ship was not withdrawn from service, as there were further orders for the carriage of goods within the Mediterranean. The last few days of 1967 the ship was spent in the port of Chalkida located in a narrow isthmus separating the island of Evia from the shores of mainland Greece. It was a very busy time for both the crew of this ship and the captain who supervised the loading of 440 tons of cement. Due to the hygroscopic properties, it required a particularly careful protection against moisture, which is not difficult on the sea ship. Time was pressing because the cement recipient was already waiting for his cargo in one of the countries on the north coast of Africa. Eventually, the day before New Year's Eve the ship was finally ready to embark on the next cruise. The first stage of the road led along the coast of the island of Evia. In spite of not good weather, Dimitrios P. was laboriously and uniformly defeating the miles of a narrow bay separating this island from mainland Greece. The crew became convinced very quickly about the bad conditions at the time in the Aegean Sea. Due to the raging storm, already at the end of the first week of January 1968, after reaching the edge of the Peloponnese, the ship was forced to stop the cruise and seek a refuge. Dimitrios P. was anchored in the area of ​​the Diakofti port located on the island of Kythira. The slight improvement of the weather, which took place on January 6, meant that the captain decided to continue the cruise. Return to the route leading to the African coast did not last too long. In the following days of January, the crew of Dimitrios P. again had to deal with such bad weather conditions that the captain was again forced to seek shelter. By changing course to the north-west, he directed the ship towards Crete. The small strait separating the south coast of Imeri Gramvousa and Cape Tigani was to be another safe haven to protect Dimitrios P ​​from the storm. The crew learned about the illusion of safety on January 8. At 13.15, when the raging maritime element showed its full strength, the left anchor chain was broken. Despite the intense attempts made by the captain and his crew, Dimitrios P. could not be kept away from the coast of the island of Imeri Gramvousa. The pushing waves pushed him towards the shallows, where he then settled. Although there was still a shadow of hope to save the ship, the flooded engine room sealed his fate. The captain made the right decision about the evacuation. Although the proximity of Imeri Gramvousa was the beginning of the ship's unhappiness, it was also the island that saved all the crew members of Dimitrios P. Due to the still bad weather, the sailors spent another two days there. It was not until January 10 that the Greek destroyer Ierax arrived on the island, stationed in the Souda base. 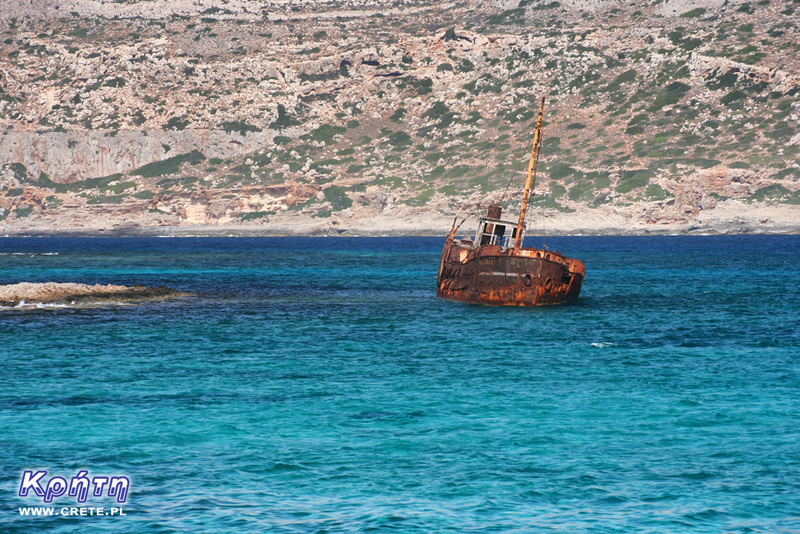 Today, this wreck has become an inseparable component of the stunning landscape of the island of Imeri Gramvousa. Each subsequent season of storms marks the remains of this ship. It is quite possible that over the next several or several years, the wreck of Dimitrios P. may completely disappear or turn into a shapeless pile of scrap. However, the number of photographs on which this place was immortalized causes that this ship has acquired a specific immortality status.